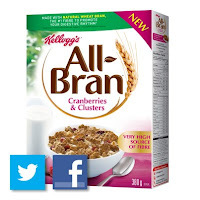 This was posted on the Kellogg’s Canada Facebook page: Hey, Toronto fans! Get a full-sized box of the new Kellogg’s All-Bran* Cranberries & Clusters cereal at our All-Bran* Tweet Shop! The price? Just one tweet or Facebook post telling your friends what you think. We’ll be at the Toronto Eaton Centre (near Sears on level 3) from Thursday, March 7 through Saturday, March 9, 2013 during mall hours (Thursday/Friday 10 a.m. to 9 p.m.; Saturday 9:30 a.m. to 7 p.m.). See you there!